What $3.4tn will not buy you. Paul Davies at FT Alphaville argues that the $3.4tn in foreign reserves that China holds cannot be used to address with their problems of bad debt. The article follows a series of reports by the FT on the increasing and unsustainable amount of debt that we see in China these days. As an example, here is a chart from one of those earlier reports. From the chart we see increasing levels of debt by all sectors of the Chinese economy. So China looks like the US now... or not. The data on debt is just a partial view on the balance sheet and the potential instability of a financial system. It measures liabilities, it does not look at assets. What happens if we look at the value of assets in the Chinese economy? They are increasing at a faster rate than debt. How do we know that? Because we know that China has been running a current account surplus, a sign that income exceeded spending and therefore the country was a net saver. The accumulation of current account balances does not exactly correspond to the net foreign wealth of a country because there can be valuation changes over time. I might save $100 today and buy shares in the stock market or a foreign government bond. My wealth tomorrow might change by more or less than $100 depending on how the prices of those assets change. Pierre-Olivier Gourinchas and Helene Rey have produced some neat analysis on how these two magnitudes differ for many countries, here is their chart for China. The red line corresponds to the accumulation of current account surpluses (expressed as $ of GDP), this is the flow of saving. The blue line is the actual value of their "net foreign wealth". In the case of China the blue line is below the red one which means that China has suffered valuation losses in their external balance sheet; the value of their assets has appreciated less than the value of its liabilities (this could be partially due to the fact that their assets tend to be riskless while their liabilities tend to be of the form of FDI). Where do foreign reserves enter into the picture? The accumulation of foreign reserves comes from two sources: the funds generated from current account surpluses and the (net) investment flows into China. For example, when a multinational invests in China (FDI), that flow, if unmatched by any other flow, leads to an accumulation of foreign reserves. As Paul Davies points out in his article, those reserves cannot be simply considered wealth of China because FDI represents a liability. Correct. The right number is the one where all assets and liabilities are taken into account, which is the blue line in the Chart above, the net foreign asset position which stands just below 30% of Chinese GDP (about $2tn). This number is indeed lower than the total amount of foreign reserves that China holds ($3.4tn). So China is a country of savers and borrowers, like any other. In aggregate, the country saves as reflected by a current account surplus. 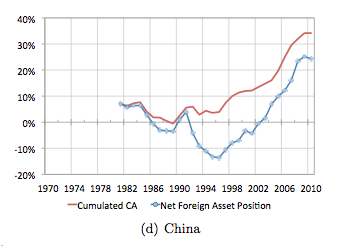 Its nets foreign asset position is about $2tn, a true measure of the health of the external balance sheet of China. The amount of foreign reserves is not the right measure as it exaggerates the foreign wealth position. And for the same reason, the first chart with the debt numbers provides a too pessimistic view of the Chinese financial health. Both of these figures are just partial views on the Chinese balance sheet. Given that net foreign wealth in China is positive and increasing, does it mean that there should be no concerns about the increasing debt in some sectors of the economy? No. There are two things to worry about. First, the fact that some (individuals, corporations, government) are accumulating debt could put them at risk even if others in the economy are saving. Financial fragility is not only about the average position it is also about the individual saving/borrowing positions. Second, some of the borrowing goes to fund purchases of domestic assets that might have an inflated value. So even if today when we aggregate assets and liabilities the balance sheet looks healthy, we could have asset values collapsing and sending the net wealth of individuals to a situation that leads to defaults, need for deleveraging and a crisis (as we have seen in many advanced economies). Teaching about inflation is fun. Most people who have never been exposed to macroeconomics before are surprised when you show the correlation between inflation and money growth in a large sample of countries. You then produce some data about some hyperinflation countries that include a picture of some bank note with lots of zeros (thank you Zimbabwe) and the students love it. The notion that inflation is (mainly) a monetary phenomenon is new to many students and going through the history of inflation and monetary policy regimes is a very rewarding exercise for a teacher. But there is a problem with the way we teach inflation: in many countries inflation has been under control for decades now. And this control does not come from the fact that monetary policy was anchored to a physical commodity such as gold but from the actions and credibility of the central bank. 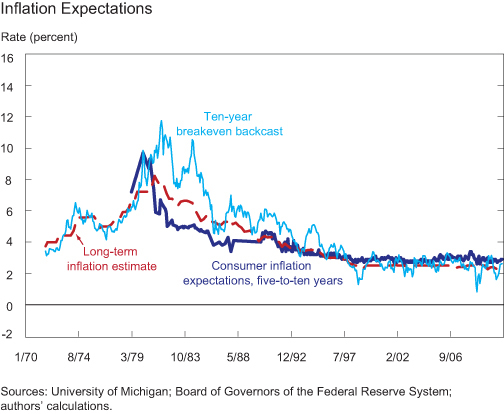 Here is a nice chart from recent work from Jan Groen and Menno Middeldorp that measures inflation expectations in the US going back to 1970. After the early 90s the line becomes flat, there is very little to say about either the level or the volatility of inflation. In this environment, inflation is almost constant and the correlation between money supply and inflation is inexistent. But we leave this fact for the last five minutes of the class given how much fun it was to talk about Germany in 1923, Hungary in 1946 and Zimbabwe in 2008. Next time I teach my macroeconomics course I will spend less time talking about inflation and if I talk about it, I will not show the picture of the one hundred trillion dollars note from Zimbabwe, instead I will spend more time about the incredible stability of inflation in many countries. And I will use the extra time to talk about long recessions and even longer recoveries. 1. Using a model where crises and booms are driven by shocks (unexpected events). 2. In terms of a a succession of phases (expansions and recession) where the key is to define turning points that represent the transition between phases. Using a model with shocks allows for a much richer description of business cycles. We can allow for shocks of different size, talk about the dynamic response to shocks, etc. But it happens to be that some economies (and the US in particular) behave in a way that can be approximated by periods of calm and stable growth rates (expansions) that get interrupted by sudden drops in growth (recessions) that are short in nature. And this is why we summarize the volatility of economic variables around the notion of infrequent and negative events that we call recessions. Such a simple (simplistic?) description of cycles is used by the NBER business cycle dating committee and has become a very common way to analyze the business cycle in other countries. Not all recessions are alike, some are worse than others. One way to distinguish the severity of recessions is by looking at their length; this is the NBER approach to this issue, longer recessions are seen as "more severe" recessions. How good is this approximation? It might be that the number of quarters is not a good-enough indicator, as you might have two recessions that last for four quarters that look very different. But it happens (in the case of the US) that recessions are mostly short and their shape is similar so the length of a recession has been considered a good-enough approximation to its severity. In my recent work with Ilian Mihov (summarized in this post at VOX), we question the use of the length of the recession as a good indicator of the severity of crisis by putting forward an additional argument that requires redefining the phases of the business cycle. When a recession is over, the economy has reached a turning point, the trough. It represents a move away from a period of "declining economic activity", the NBER definition of a recession. But what happens afterwards? How long does it take to go back to normal? Where by normal we mean a level of output, employment which is consistent with the notion of trend or full employment. The NBER methodology has never dealt with this question. Once the recession is over, an expansion starts and there is no further communication from the business cycle dating committee until another recession starts. No explicit description of a recovery phase. Is this approach good enough? It could be if recoveries were symmetric to recessions. If the length of the recovery was directly linked to the length of the recession then we could use the length of the recession phase as an indicator of the full consequences of the crisis. But our research shows that this is not the case and, in addition, the length of the recovery phase is becoming longer over time (at least according to the last two or three recessions). To understand our point, let's compare three similar US recessions. According to the NBER, the three worst (longest) US recessions after WWII were: the 1973 recession (4 quarters), the 1981 recession (4 quarters) and the 2007 recession (4.5 quarters). The three are almost identical in length. In our research we have dated a recovery phase, defined as the time it takes for the US economy to go back to trend (or "full employment") and we can see that the three recoveries look very different. In particular, the 2007 recovery is already 16 quarters long (and we are not done) while the 1981 recovery was only 5 quarters long and the 1973 recovery was 6 quarters long. In other words, the cost of the 2007 shock is much bigger than that of the 1973 or 1981 ones even if the three recessions looked almost identical. In conclusion, the use of the recession dates and their length can only provide a very partial and possibly misleading view of the shape, severity and length of crises. If we are using a framework (such as the NBER one) that summarizes business cycles around infrequent and negative shocks that we call recessions, we need to be explicit about what happens in the quarters of years that follow the trough, the turning point as we exit the recession. We are aware that dating the recovery phase can be difficult and subject to uncertainty (and endless debates among academics), but this difficulty should not stop further research from trying to establish consensus around some basic stylized facts about the shape of this third phase of the business cycle. There is an increasing debate about the ability of emerging markets to continue growing at the pace at which they have been growing over the last years. 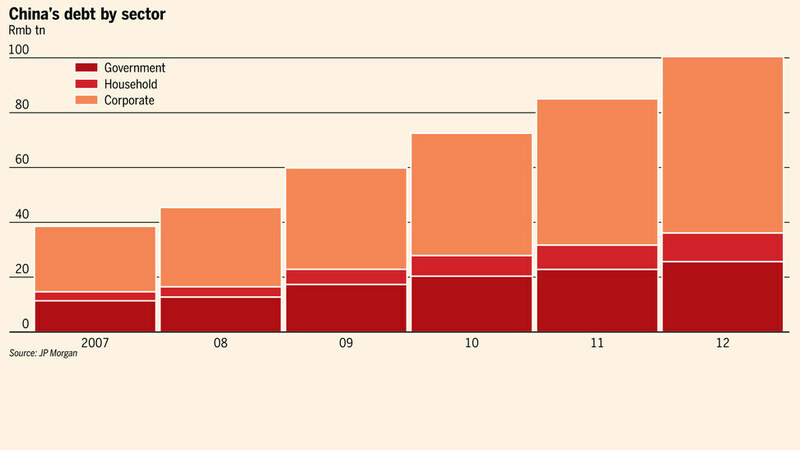 The last decade has been remarkable for emerging markets as a group. 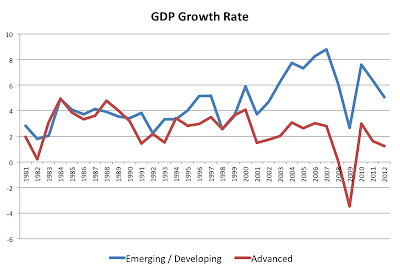 The chart below compares the growth rate of (real) GDP for the group of advanced economies and for the group of emerging and developing economies (definitions and data coming from the IMF). After decades where emerging markets were growing at best at the rate of the advanced economies, since 2000 we see a clear gap in growth rates and a strong process of convergence or catching up. The difference is large, as large as 4 or 5 percentage points in many years. There are many potential reasons why the fate of emerging markets changed since 2000. From a regional perspective Asia was already doing well in previous decades and continued to grow at a strong or even stronger rate. Some countries in Latin America started growing at decent rates after really weak performance in the previous decades. And African growth rates have been at the highest level in many years. During those years we have also seen another strong trend in the world economy, the fast growth in the prices of commodities. The fact that these prices have increased can be seen as the outcome of strong growth in the world (fueled by emerging markets). But the causality also runs backwards for some of these countries: it was the strong demand coming from certain economies that pushed prices up and allowed those countries that produce commodities to see growth finally happening. 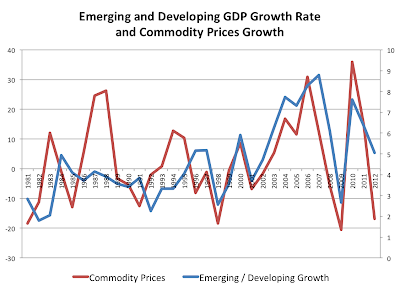 The data shows that indeed, the phenomenal growth in emerging markets post-2000 coincided with positive developments in commodity prices. 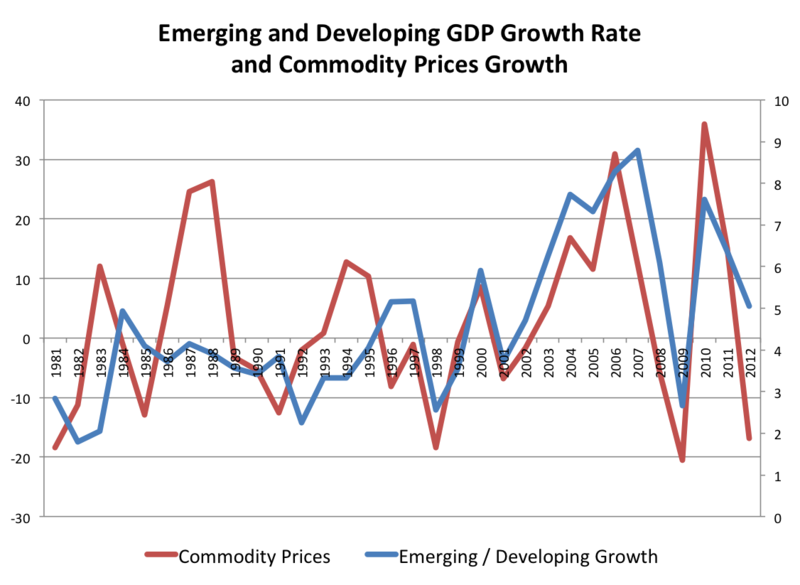 The figure below compares the growth in GDP of emerging and developing countries (from the previous figure) with the growth in the price of commodities during the same years [Note: the series used for commodity prices is Commodity Industrial Inputs Price Index includes Agricultural Raw Materials and Metals Price Indices from the IMF; including food prices or oil prices to the index does not change the correlation at all]. What is remarkable about the data is not that there is a strong correlation in the post-2000 period but also that this correlation has become much stronger than before. For the reasons outlined above it makes sense that these two series are correlated, what is interesting is that the correlation has become strong in the years where growth in emerging markets has taken off. And this cannot simply be the fact that emerging markets matter more in the world economy (and therefore have a strong influence on the price of commodities). If this was the case we would simply expect the other countries (advanced) to have a much stronger influence in the earlier years, but this is not the case. To explain the correlation above we probably need a combination of qualitatively different growth during these years that is putting demand pressure on prices while at the same time the producers of commodities (mostly emerging markets) benefit from this demand and grow at higher rates. But regardless of the explanation, it is important to realize how the fate of emerging markets and commodities prices is much more linked than in the past.